Due to SiC's propery of heat-resistance, chemical resistance, high hardness and high thermal conductivity etc, SiC refractory can be applied in various fields. 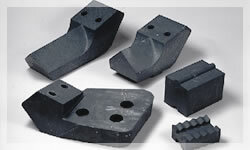 We can provide various shapes of SiC refractory. For advanced ceramic products which require SiC avoidance, and for ferrite products, we can provide high bend resistant setter which SiC is sandwiched between alumina. High wear resistance and high thermal shock resistance slab for pusher kiln. Block lining of heating boiler water pipe in waste insinerator. 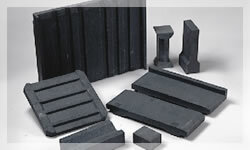 SiC refractory is versatile product that has many other usage aside from what's listed above. Please let us know your usage needs, in terms of shape size and property. Please contact us if you consider purchasing SiC kiln furniture or would like a competitive quote to compare with your current vendor. We are specialists in this field with a lot of experience, and are able to provide best SiC refractory for your application.